Don Verlin likes the makeup of his team. And he likes that it will be pushed by a number of quality nonconference opponents before Big Sky play. The Vandals, who return 12 players, have mid-November games at Northern Illinois and Little Rock, two schools that beat UI in Moscow last year. They also travel to Stanford (Dec. 22) and Washington State (Dec. 7) and have a home-and-home with South Dakota State, who went 26-8 last year and made the NCAA tournament. MOSCOW, Idaho – Perrion Callandret sometimes looks down at his jersey on the court and remembers. He remembers how blessed he was to play with his half-brother as a freshman, despite the fact that he was 18 and Glen Dean was 24. 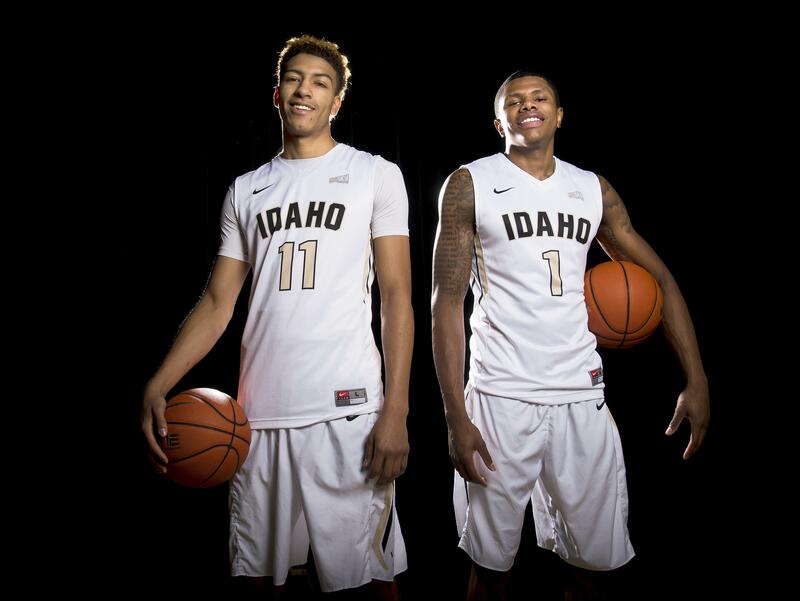 During that one season they were together at the University of Idaho, in 2013-14, Dean’s jersey number was No. 1. Callandret, now a senior point guard for the Vandals, wears the same number and scans the stands to find his brother and mother, Judi Sinclair, watching him with pride. Callandret’s story is also personal for UI assistant coach Kirk Earlywine, and for good reason. Four years ago this fall, Earlywine helped convince Callandret to sign with the Vandals out of Bothell (Washington) High School. The next spring, he helped bring Dean to Idaho as a graduate transfer from the University of Utah. Earlywine still remembers the first practice with Callandret and Dean on the same floor. But the coach’s connection to the brothers from the Seattle area goes back longer than that. It was seven years ago, in fact, that Earlywine – then the head coach at Eastern Washington – heard about Dean and got to know Sinclair. He brought Dean to Eastern after an Eagles player who was friends with the mature but fiery point guard recommended that Earlywine look into him. EWU fired Earlywine in 2011, which prompted Dean to transfer to Utah before the next season. The two stayed in contact, and it made sense for Dean to consider UI as a graduate transfer – especially since his brother had already committed to the Vandals. “The relationship I had with their mother,” Earlywine said, “I think was definitely a factor in Perrion signing with us that fall and then the following spring Glen graduating at Utah and having that fifth-year option that so many guys are taking advantage of now. Callandret is now focused on winning a Big Sky Conference title in his last year in Moscow. He and Victor Sanders form one of the best backcourts in the Big Sky, something they proved last year before (and somewhat after) both got hurt in January. Callandret suffered a Lisfranc injury of his right foot and missed nine games. Sanders broke his hand and missed seven games. While Sanders came back healthy in mid-February, Callandret returned a few days after his backcourt mate but “wasn’t right,” Earlywine said. It took until two weeks after the Vandals’ summer trip to China for Callandret to consider himself all the way recovered – both physically and mentally. The 6-foot-2, 180-pound floor leader averaged 14 points in 25 games last season, just behind Sanders (15.9 ppg) for second on the team. Nonetheless, coach Don Verlin wants Callandret to be a pass-first point guard. “He’s got to run our team,” Verlin said. UI coaches also expect Callandret and Sanders to become more vocal leaders to fill a void left by Chris Sarbaugh, a Spokane native who made a strong impact last year as a graduate transfer point guard. Which sounds good to Callandret. Published: Nov. 3, 2016, 4:38 a.m.